Other products you might be interested in.. But it's a whole different story if you want to be HUGE! If the only thing you want is to be huge, grow big muscles and get mad strength, meet Muscle Infusion. From the infamous Black line (a.k.a. 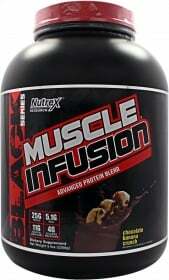 the Underground), Nutrex presents you Muscle Infusion. Protein is the foundation of building muscle. A simple analysis tells more protein means bigger muscle growth. Muscle Infusion is power-packed with protein featuring an overwhelming blend of 7 multi-functional protein sources that have varied absorption rates and distinct amino acid profiles. Right after working out, your muscles hunger for nutrients. Nutrex Muscle Infusion is the perfect source of protein nourishment for your muscles, kick-starting muscle growth with the fast-absorbing proteins and following through with a continuous surge of muscle-building nutrients with slow-digesting proteins. On top of its superior effectiveness, it delivers a great tasting shake that's low-fat and low-sugar. Experience superior muscle growth by using the bodybuilding world's best kept secret, Nutrex Muscle Infusion! Disclaimer: This product is not intended to diagnose, treat, cure, or prevent any disease. Results may vary from individual to individual, depending on a range of factors, including gender and age. There are no Q/A in English Would you like to see Q/A's in other languages? Have a question about Muscle Infusion? What is it, what does it do, how and when to use or something else? Ask us. Disclaimer: The reviews provided in this page reflect the personal opinion of the corresponding user. Results may vary from individual to individual, depending on a range of factors, including gender and age. There are no reviews in English Would you like to see reviews in other languages? 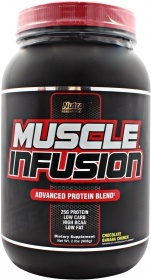 “Muscle Infusion 5 lbs” is currently out of stock. Enter your details below and we will let you know when it's back in stock. I would like to receive stock alerts, as well as to receive news, informations and promotions from Zumub. ALLERGEN INFORMATION: This Product Contains Ingredients From Milk And Egg. Manufactured In A Plant That Also Processes Milk, Egg, Soybeans, Peanuts & Peanut Flavor, Tree Nut, Wheat Products And Fish Oil. Normal Dosing Protocol: Mix one level scoop with 177ml-237ml (6-8 oz.) of water. Drink 2-4 servings per day. Muscle Infusion Black can be taken at any time during the day or night. UnderGround Dosing Protocol For MONSTROUS Lean Muscle Growth: Mix two level scoops with 355ml-473ml (12-16 oz.) of water. Drink up to 3 servings per day. For beyond extreme lean muscle gains drink one UnderGround serving prior to going to bed to flush your muscles with large quantities of growth facilitating protein. Repeat daily and be consistent. WARNINGS Muscle Infusion : Keep out of reach of children. Store in a cool, dry place. Food supplements should not be used as a substitute for a health and varied diet. These statements have not been evaluated by the FDA. This product is not intended to diagnose, treat, cure, or prevent any disease. Attention: It is advisable to consult a doctor or nutritionist if you are unsure about the consumption of this product. The nutritional values may have slight variations depending on the chosen flavor. I agree to receive news, informations and promotions from Zumub. I agree to receive answers to my question, as well as to receive news, informations and promotions from Zumub. Would you like to receive news and offers? Get 3% of the value you pay in ZumubPoints, to exchange for free products! Read more. These coupons allow you to accumulate credit in the form of discount coupons. Read more. If you are not 100% satisfied with the product, return it and we will refund 110% of the value you paid. Read more.